Posted 30 October 2013 under Ask Us. 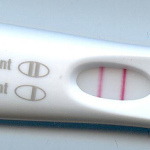 Missed period: The most common symptom of pregnancy is a missed period. Some women can have spotting or very light bleeding in the very beginning when the fertilized egg attaches itself to the inside (wall) of the uterus. This is called implantation. Breast soreness: Because of the hormone changes that happen with pregnancy, a woman’s breasts will likely feel fuller than usual, swollen, sore or feel tender when touched. Tired: Feeling tired during pregnancy, especially early on, is normal. Nausea: Nausea during pregnancy is usually called “morning sickness” although the feeling can be anytime during the day. Although this symptom is common, not every woman has it. If you’re sexually active and not using an effective birth control method, there’s a risk you could become pregnant. It’s important to know early on if you are pregnant so you can make the right decision for you. You also need to eat well, get the rest your body needs, and take a vitamin with folic acid. A pregnant woman shouldn’t smoke or drink alcohol either. If you’ve missed your period or your period is lighter than usual, make an appointment with your health care provider for a pregnancy test. If you’re not pregnant, now is a good time to talk about whether you want to be sexually active and the most effective form of birth control for you. If I’m on the Pill and my bf ejaculates inside me, can I get pregnant?